The road leading to our next destination was notably clear of traffic, we can even count in our fingers how many jeeps and cars passes by. Although uncommon, it wasn't surprising as this scenario happens every time a Pacquiao fight transpires. I've been to a number of lakes. One of our clan's property sits in a charming cove in Lake Sebu which I try to visit every time I fly south of Mindanao. Understandably, I feel much at home with lakes. Swimming in it is another thing. I must confess, I've never tried swimming in a lake before simply because I don't know of a swimmable lake pool that's easily accessible. Poor Laguna girl, it was only a month ago when I realized that there's a lake, just an hour ride from home that's interesting enough for a day swim. From Villa Sylvia Resort in Nagcarlan, we hailed a jeepney bound to San Pablo and alighted at what seems to be an abandoned parking lot. There we met ate Siony (09299789565) who guided us on a 10-15 minute walk to the lake's entrance. And there lies San Pablo's best kept secret, Lake Pandin. San Pablo, Laguna may seem to be an off beaten path that is unknown to many, caters a hidden eco-tourist spot. 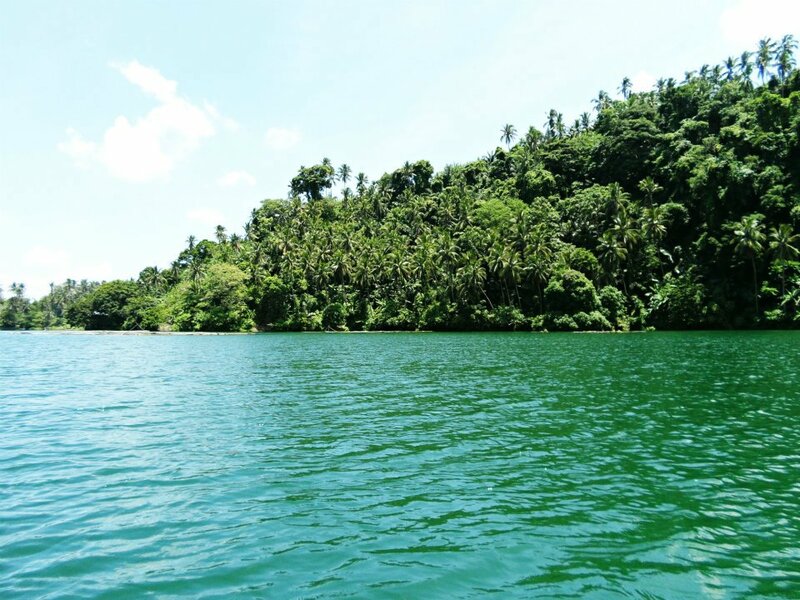 Also known as the City of Seven Lakes, San Pablo is one of the country's oldest cities and the largest province in terms of land area in Laguna. And with Lake Pandin known to be the cleanest, we can't help but be excited for the day's activity. About 5 floating bamboo rafts are parked in front of us, already filled with exciting tourists. Ate Siony escorted us to our designated raft. Women wearing uniformed orange shirts started laying our prepared food for lunch. 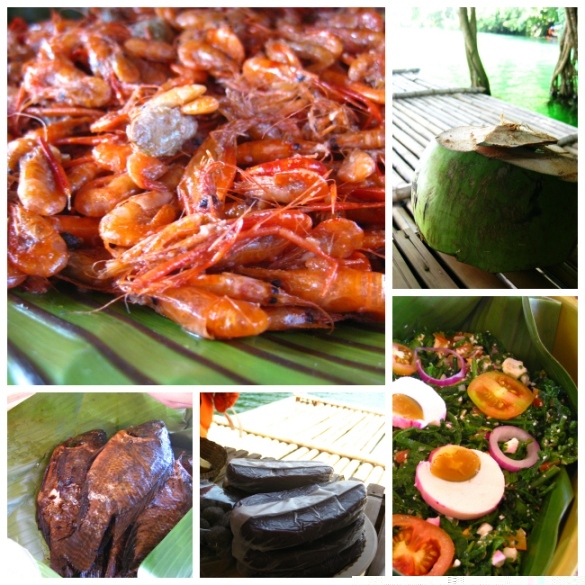 The menu consists of ginataang hipon, inihaw na tilapia, ensaladang pako, kanin sa binalot na dahon, saging and buko. We were also offered one of San Pablo's specialty - Ube halaya for dessert. 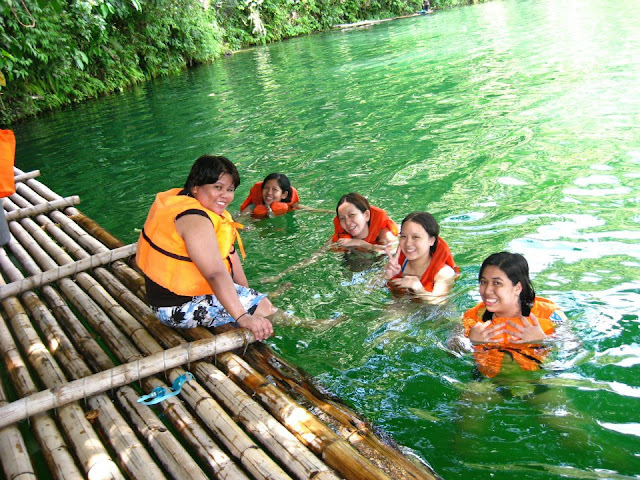 This Php360 lake tour (Php180 if without food) takes 2-3 hours. Before the actual lake tour started, Ghia immediately noticed a familiar face sitting from a neighboring raft. It was Audie Gemora enjoying his time with his family. Wow, we'll be sharing the lake lunch tour experience with a multi-awarded theater actor and mentor. The moment we saw him, that Dunkin Donut Merry Munchkin song started playing in my head. They were many, and the excited kids started jumping onto the placid lake water. Ate suggested that we start eating after our short trip to Lake Yambo (another one of San Pablo's Seven Lakes) and nearest to Lake Pandin. So we covered the food with native plates while our 2 guides started pulling the ropes tied from both ends of the lake and eventually paddles til we reached the jump off point going to other side of Lake Yambo. Dun pa lang na pa-wow na nila kami. Our ate's paddled us to a nearby tree. There are large canopy trees at the far end of the lake and visitors can choose one to their liking, these areas provided that much needed privacy for each toured group. For 2 hours or so, we took refuge into these trees providing us with just enough shade while enjoying our fresh buko juice and our delicious lakeside lunch. It was also at this instance that we learned from our guides about Pacquiao's controversial defeat over Bradley, they were intensely watching the fight from their phone - sosyal! We took a short rest after lunch while our guides laid a makeshift bed in one end of the raft using the remaining life vests as their foam bed. Ang sarap nga naman talagang matulog sa lake! Conscious of our remaining hours left, we decided to swim. The color of the lake sure looks very inviting for a short dip. Ghia (the one still sitting on the raft) asked ate how deep this lake water is. Ate: "180 feet po Ma'am." Ghia: "Ay ayoko dito na lang ako. 5 feet nga takot ako e, 180 feet pa!" We all tried convincing her to just take the plunge. I may not be a good swimmer and even though the idea of someone/something pulling me into the deep scares me for a while, the drive to enjoy and swim in a lake shook off the fear. And knowing that we have our two ate's always ready to jump for us, made me feel more safe. Before going back, we quickly "showered" at the spring water nearby. This grotto is an added attraction. It's also the community's only source of drinking water so our lady rafters had to refill gallons of water containers before paddling us back. A toilet nearby can be accessed for tourist to change into their dry clothes. We also bought sets of their Ube halaya for pasalubong (sells 3 pieces for Php100). I regret buying just one set, my family went crazy over the ube. For the next visitors of Lake Pandin, I firmly suggest buying their homemade Ube halaya, it's cheap and so delicious! 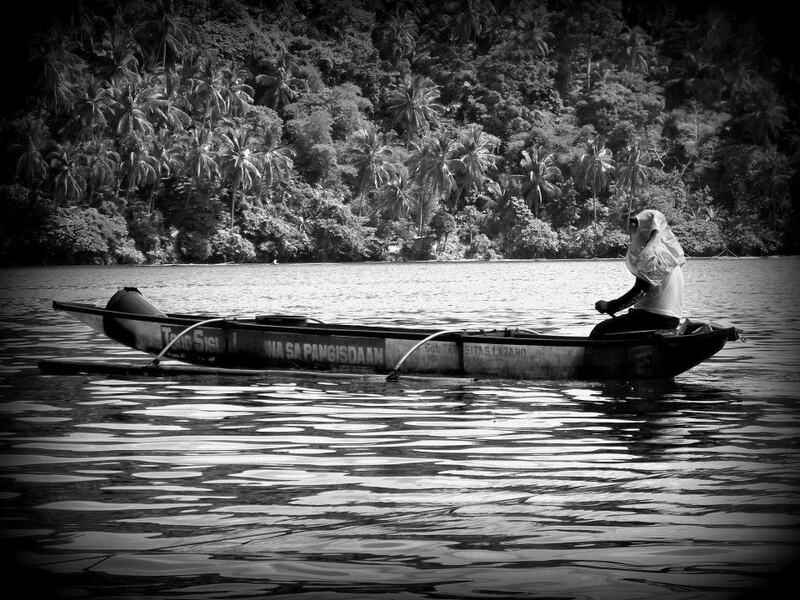 Hats off to the local community most especially to the women of Lake Pandin who responsibly took advantage of the area's bountiful resources and for preserving the lake. This tourist attraction is creating a sustainable livelihood. We immediately felt the "samahan" upon sitting down the raft, everyone has a delegated task and the whole trip was so orderly. We were well taken care of up until we finished the tour. Next time you visit Laguna, you might want to think twice before booking a place with a private pool or paying a hefty entrance on a resort with spectacular waterpark features. Think beyond man-made waterpools. These natural bodies of water heeds the call for adventure that no modern pool can provide. i've been wanting to go to San Pablo to visit the 7 lakes. sino po ung contact no nyo para dito sa Lake Pandin? Good Thing I saw your blog. This is really helpful. Plan to visit Lake Pandin since 2008! Now it get's easier because of this. Glad to know :) Enjoy your Lake Pandin Experience!